The general structure for this dish comes from one in Modern Mediterranean Cooking by Elen Balashova. Her recipe suggested this dish could be completed on the cook top is around an hour by just simmering the lamb shanks. Having cooked lamb shanks before I just didn’t see that happening. So I turned to the pressure cooker to speed up the process. I also added red bell pepper for some color, Serrano pepper for a bit of heat and preserved lemon for a deeper flavor. A finish with fresh lemon juice helps awaken the broth. Heat oil over medium heat in the bottom of the pressure cooker. Sprinkle lamb shanks with salt and pepper then brown in the oil, 3-4 each side. Set aside the shanks and drain the fat. Return 1 tablespoon of fat to the pot. Add the onions and peppers. Scrape to release and fond created by browning the shanks. Cook until they start to soften, about 5 minutes. Add the garlic, tomato paste and oregano, stir into the other vegetables and cook until aromatic (about 1 minutes). Add the water and bring to a simmer. Add the shanks to the pot along with 4 cups of water. Slap on the cover, lock it in place and heat to a steady release of steam is achieved. Cook for 35-40 minutes, adjusting the heat as needed to have a low and steady steam release. Turn off the heat, remove the pressure cooker from the burner and perform a quick release on the steam. Remove the cover and check the meat. It should be falling off the bones. If not give a little pull with tongs; if it comes off easily then your good to go. If not recover, return to pressure and cook another 5-10 minutes. When you meat is done remove to it a dish, add the remaining water plus a tablespoon of salt and bring it to a boil. When the broth is boiling add the orzo and cook for 5 minutes. Add the butter bean and liquid, chopped olives and preserved lemon, stir to incorporate. Cook for another 5 minutes. While the dish finishes cooking pull the meat from the lamb bones and shredded into bite size pieces. You can return these to the pot at any point. Add the lemon juice, stir to incorporate and taste for salt/pepper. Adjust as needed and serve. If you don’t finish this in the first serving the orzo will likely take over. Don’t worry about it. You can add a bit of water when reheating to thin out the leftovers. Don’t have preserved lemon, don’t worry about it. You could zest your lemon and add that at the end along with the juice to add a bit more lemony flavor. Or leave it out. This sounds pretty fancy however it can come together in 35 minutes. You can even make this a one-pan meal if you want, though two skillets are necessary to hit less than 30 minutes. An agrodolce is an Italian sweet and sour sauce. I’ve added a flavor boost with some anchovy paste and a bit of sriracha. Neither is really noticeable with all the vinegar and sugar. They’d be missed if they weren’t there though. Heat 1 tablespoon olive oil in a non-stick over medium heat. Add the peppers and onions, sprinkle with salt and pepper, toss with the oil and allow to cook for 5 minutes. While the peppers cook combine the vinegars, sugar, anchovy and sriracha in a small bowl and stir until the sugar is dissolved. Stir the sauce into the skillet until the onions and pepper are coated. Reduce the heat to low and allow the sauce to reduce and thicken, about 10 minutes. When the sauce is reduce transfer it to a clean bowl and cover it with a plate (or plastic wrap) to keep warm. Wipe on the skillet as best you can and return the skillet to medium heat. Add the remaining tablespoon of olive oil and heat until shimmering. Pat dry the cod fillets, sprinkle with salt and pepper and add to the skillet. Cook for 4 minutes on the first side, carefully flip to the uncooked side and cook for another 2-3 minutes. The fillets should be opaque all the way through. An instant read thermometer will hit 140°F when the fish is done. To serve spoon the onion/pepper mixture onto your plate and place a piece of cooked cod on top. Tilt the pan and gather a spoonful of sauce, drizzle this over the fish. A bit of freshly cracked black pepper and a sprinkling from on high of sea salt will add a nice finish. 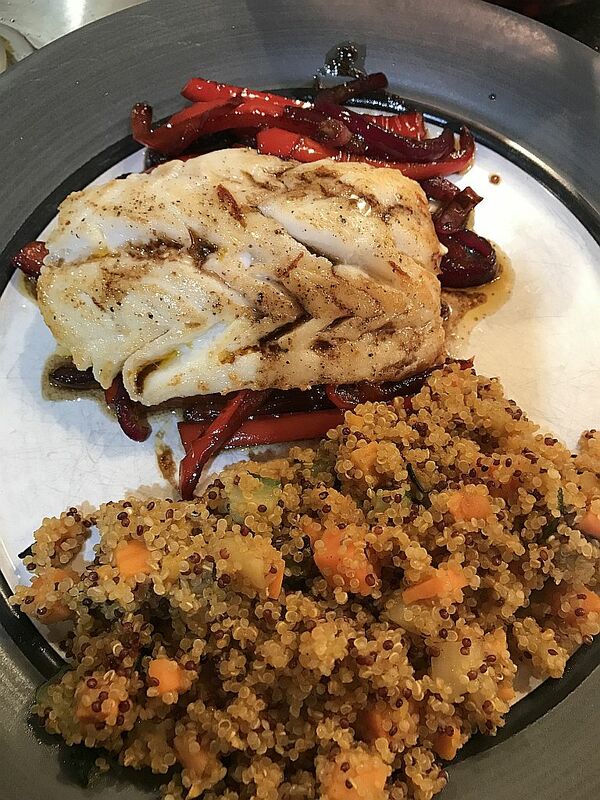 I served it with a rice/quinoa I found in the grocery freezer section. If you want to dirty an extra pan you can cook the fish in a second skillet when the sauce has reduced for 5 minutes. I have a small squeeze tube of anchovy paste that I use in dishes such as this. I picked it up in the Italian food section of my local grocery store and keep it in the fridge along with a tube of tomato paste. The great thing about paste in a tube is it will last longer because there is little to no air in contact with the unused portion. Plus it had a “good until” date of two years into the future so I don’t have to find 17 uses for anchovy paste in one week. My godchild V wanted to learn how I make deviled eggs and so a menu is born. I appear to be on a streak of nostalgia led cooking. I remember having a dish like this on a retreat in my late teens. Simple food, prepared well, with a lot of flavor. Every recipe I found online for “chicken and stuffing bake” put the chicken on the bottom, added condensed soup on top of the chicken and then piled the store bought stuffing on top of that. That did not match my memory or desire so I made it up as I went. Not bad for a first pass though I missed a couple of things which I’ve corrected in the recipe. This recipe has several components so I’ve written each component in its own section with a final set of directions at the end of combining everything together. Preheat oven to 250°F. Distribute bread cubes in a single layer across 2 rimmed baking pans. Bake for 20 minutes, swapping the position of the pans halfway through. While the bread cubes dry out heat the olive oil in a 12″ skillet over medium heat until shimmering. Add the carrots, celery and onions, sprinkle with salt and stir to coat with oil. Cook for ~10 minutes until carrots begin to soften and onions are translucent. Add the butter, herbs, and broth. Bring to a simmer, stir so the butter is spread throughout the vegetables and taste. Add salt and pepper to your liking. Set aside. When the bread cubes are done transfer them to the bottom of a large casserole dish. Add the veggie mixture and toss combine. Spread evenly across the bottom of the dish and set aside. Put the mushrooms in a microwave safe bowl, cover with plastic wrap and microwave for 5 minutes on high. Drain liquid from the cooked mushrooms and set aside. Careful, that bowl will be hot. Heat olive oil in a saucepan over medium heat and add the shallots. Sprinkle with salt. Cook for 5 minutes until the shallots have softened and are beginning to brown. Add the butter to the pan. When it is melted add the mushrooms and cook for another 5-10 minutes until they are browned. Sprinkle the flour over the mushrooms, stir until all the flour is moistened. Cook for about 1 minute to drive off the raw flour taste. Add the broth to the pan and stir until combined. Add the milk and combine. Bring to a simmer and cook for 10 minutes. The sauce will be slightly thickened. Taste and add salt and pepper to your liking. Set aside. Trim the chicken breasts of excess fat and cut in half across the middle of the breast. Season the chicken all over with salt and pepper. Distribute the chicken pieces over the stuffing. Give the sauce a stir to reincorporate any “skin” that has formed on top. Pour the sauce over the chicken pieces. Use a spatula to smear sauce over to top of the pieces. Cover the pan with aluminum foil. Bake for 40 minutes, rotating the pan halfway through cooking. Remove the foil and continue cooking for another 10 minutes to lightly brown the top of the chicken. Check the chicken temperature; they should reach 160°F when fully cooked. If possible, allow the chicken to rest for 10 minutes before serving. Serve directly from the baking dish and enjoy. My estimates for total time here assume you don’t mind having multiple pans on the stove at one time. If you’d rather do everything in a serial fashion (make the stuffing, then make the sauce, then assemble and bake) add an extra 30 minutes. In a rarity this summer and fall it was rainy over the last couple of days. Rainy fall weather puts me in the mood for soup. I like this white bean and kale soup because it is easily converted to vegetarian and remains flavorful.